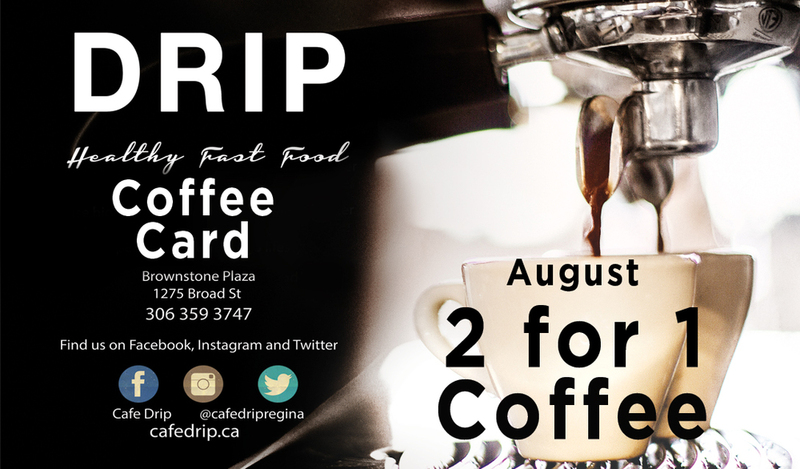 August DRIP Coffee - 2 for 1: Thank you Regina! We've been open for 3 months. The hard work we've put into harassing you via Facebook, Twitter & Instagram has worked! You've come to eat, drink and hang out in our space. And you've made it an awesome place to be. To show our gratitude, we'd like to offer 2 for 1 DRIP coffees for the last couple weeks of August. We're also hoping this helps take people's minds off the fact that it's already the middle of August! Let's cheers our coffees to hopes of summer hanging on and lasting well into September! Print our August 2 for 1 coffee card from this blog post or our FB page and bring it to the shop between Aug 15th-31st (or show us the coffee card on your phone!). When you purchase a DRIP coffee, you'll receive one of the same size... for FREE. From Aug 15th-31st, show us your coffee card when purchasing a DRIP coffee. We'll send you off with a FREE same-sized DRIP coffee. Happy August! GLUTEN: Can’t live with it. Can’t live without it.